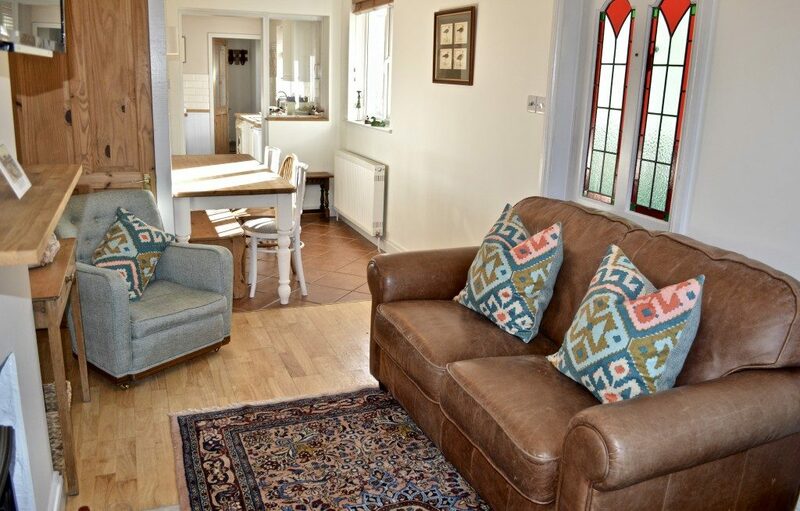 Coach House Cottage is a thoughtfully presented, stylish, coastal cottage in Cromer. It is owned by Paul and Frances as their holiday bolthole. They have really gone the extra mile to provide a super comfortable and well equipped holiday property. The house is furnished with original artworks and some vintage pieces. The owners have chosen quality linens and towels throughout. The main cottage sleeps 5, but to the rear of the courtyard is the secret Studio, which sleeps 2. This can be rented in conjunction with the cottage to provide accommodation for up to 7. Further information about The Studio available here. There is a fabulous sunny kitchen, with everything you will need, a comfortable sitting room with a woodburner and a dining table and chairs. Upstairs are three bedrooms, the two principal ones have the most stunning views over the rooftops of the old Victorian school to the church and its clock. So you will never need to look at your watch! The town, beach and famous Pier are just a short stroll away. The courtyard is sheltered and private, the most perfect spot for a peaceful read in the sun. Beautiful cottage in the centre of town with parking and a secret studio annexe. Rear door to porch, with coat hooks –Shower room off with, WC, basin and electric shower. Sitting Room: charming room with dining table to one end, comfortable sofa and two chairs. Coffee table, with lamps, book case with good selection of games and DVDs. Wall mounted TV with DVD player Wood burning stove. Laminate flooring with rugs. Stairs to first floor: Fairly steep stairs but with a handrail and lighting. Bedroom 1: Beautifully decorated room with views over the rooftops to the church. King size bed, bedside tables and lamps, wardrobe and chest of drawers. Bedroom 2: Another lovely bedroom with king size bed, bedside tables and lamps, again super views over the rooftops to the church. Original fireplace (decorative only) chest drawers, vintage chair, wall pegs and hangers. Bedroom 3: full sized single bed, chest of drawers, wall hangers. view over courtyard garden. Outside: the property has two large original coach house gates to the street. These lead to the courtyard garden which is private, sunny and enclosed. Garden furniture provided. Cromer is a traditional and elegant Victorian seaside resort, much lauded in the past which is reflected in its magnificent architecture. Recently, Cromer has had a big resurgence in popularity and exposure as a real destination holiday town. The BBC recently used the Pier as it’s focus for the Christmas indents, and the Antiques Road Show was filmed there during the last summer. The carnival is a highlight of the year, although there is something going on most weekends, and is now into its 50th year. Cromer still has the luxury of a railway station that links to mainline stations at Norwich, just 45 minutes away. A tasteful Cromer hideaway, and perfect bolthole whatever the season.